Cox, T. R. and Madsen, C. D. (2017). Relative Stiffness Measurements of Cell-embedded Hydrogels by Shear Rheology in vitro. Bio-protocol 7(1): e2101. DOI: 10.21769/BioProtoc.2101. Hydrogel systems composed of purified extracellular matrix (ECM) components (such as collagen, fibrin, Matrigel, and methylcellulose) are a mainstay of cell and molecular biology research. They are used extensively in many applications including tissue regeneration platforms, studying organ development, and pathological disease models such as cancer. Both the biochemical and biomechanical properties influence cellular and tissue compatibility, and these properties are altered in pathological disease progression (Cox and Erler, 2011; Bonnans et al., 2014). The use of cell-embedded hydrogels in disease models such as cancer, allow the interrogation of cell-induced changes in the biomechanics of the microenvironment (Madsen et al., 2015). Here we report a simple method to measure these cell-induced changes in vitro using a controlled strain rotational rheometer. Fibrosis and solid tumours are both accompanied by pathological remodelling of their native tissue (Cox and Erler, 2011; Bonnans et al., 2014). In both pathological conditions, the local tissue environment experiences physico-chemical as well as biological changes, resulting in increased tissue stiffness (elastic modulus) (Humphrey et al., 2014). The strengthened tissue/matrix regulates mechano-signaling that leads to altered cell behaviour, cell morphology, differentiation state, proliferation, migration and stemness. In preclinical animal models of cancer, these changes can drive malignant progression and metastatic spread (Bonnans et al., 2014). Not surprisingly, targeting matrix stiffening has received substantial attention in recent years, and several clinical trials have been initiated (Kai et al., 2016). The elasticity and mechanical properties of a matrix component can readily be examined using atomic force microscopy (AFM), which is a technique that provides nanometre resolution and concurrent measurement of the applied force with picoNewton resolution (Kasas and Dietler, 2008). However, AFM is not applicable to understand the elastic properties of larger 3D matrices. The mechanical properties of bulk 3D matrices can more accurately be examined using shear rheology (Picout and Ross-Murphy, 2003). Rheology is the study of how materials deform when forces are applied to them. Thus applying shear stress to a 3D matrix can determine the elastic modulus (stiffness) of a bulk 3D matrix. In this protocol we describe a method to measure cell-induced changes on matrix stiffness of hydrogels embedded with cancer-associated fibroblasts by shear rheology. Keep all reagents on ice (collagen type I, Matrigel, growth medium, 5x collagen buffer and FBS). Aspirate the growth medium from the cells and wash the cells once briefly with PBS. Aspirate the PBS, and add trypsin-EDTA (0.25%) enough to just cover the cells. Once the cells have detached, resuspend them in normal growth medium and count the cells. 100 µl HN-CAFs (500,000 cells) – cell number will need to be optimized according to the cell line (see Notes). Use 100 µl growth medium for hydrogels without embedded cells. 120 µl growth medium (cell line dependent, but typically DMEM, 10% FBS, insulin-transferrin-selenium, penicillin-streptomycin). 80 µl 5x collagen buffer (or according to the collagen amount) – vortex before aspirating. 200 µl Matrigel (or according to the desired concentration, see Notes). 400 µl collagen type I (or according to the desired concentration, see Notes). Mix the collagen type I/Matrigel hydrogels very well by pipetting up and down without introducing air-bubbles. In case bubbles occur, centrifuge the hydrogel solution a few seconds at 200 x g.
Transfer 1 ml collagen type I/Matrigel hydrogel to one well in a NuncTM Cell-Culture Treated Multidishes, 24-well plate. Avoid bubbles. In case bubbles occur aspirate the bubbles using a 100 µl pipette tip. Place the lid on the 24-well plate and transfer the plate to an incubator without adding growth medium. Let the gel polymerize for 1 h at 37 °C, 5% CO2. Add 1 ml growth medium and transfer the plate back to the incubator (washing step). Let the gel wash for 1 h at 37 °C, 5% CO2. Aspirate the growth medium without touching the gel. Add 1 ml fresh growth medium and transfer the plate to the incubator at 37 °C, 5% CO2. Leave the cells to remodel their surrounding gel in the incubator at 37 °C, 5% CO2 for 24-72 h (or until a measurement is desired). The media does not need to be replaced during the period when using the CAFs, however, it will depend on the specific cell type used. Rheological characterization was performed on all hydrogel samples using a TA Instruments DHR-2 controlled strain rotational rheometer using an 8 mm sand-blasted parallel plate geometry. Table 1 below outlines the testing parameters which we have determined to be optimal for the hydrogel setup described above using a Discovery Series Hybrid rheometer (TA Instruments). Start and calibrate the rheometer according to manufacturer instructions. Attach the stepped lower geometry to the peltier plate (Figure 1a). Attach the 8 mm diameter upper geometry (Figure 1a). Set the peltier temperature to required temperature (Table 1). Take the hydrogel out of the 24-well plate without damaging the gel using the stainless steel spatula (Figures 1b and 1c). Using an 8 mm disposable biopsy punch trim the gel to the correct size (Figures 1d and 1e). Carefully load the hydrogel into the stepped lower geometry (Figure 1f). Set a logarithmic oscillation strain sweep as per Table 1. Set a fixed angular frequency as per Table 1. Move the 8 mm upper geometry down until it just contacts the top surface of the gel (Figure 1g). Decrease the gap by small 50 microns increments to increase the axial force applied to the hydrogel (Figure 1h). Continue until a stable axial force of 0.03 N is reached as detailed in Table 1. Ensure a linear viscoelastic (storage modulus [G’]) response within the strain range evaluated (Figures 1i and 1j). Extract the storage modulus (G’) at 1% strain when comparing multiple gel measurements (Figures 1i and 1j). υ = Poisson’s ratio of 0.5 for hydrogels. Figure 1. Rheology set-up. a. Lower geometry, peltier plate and upper geometry (8 mm in diameter). 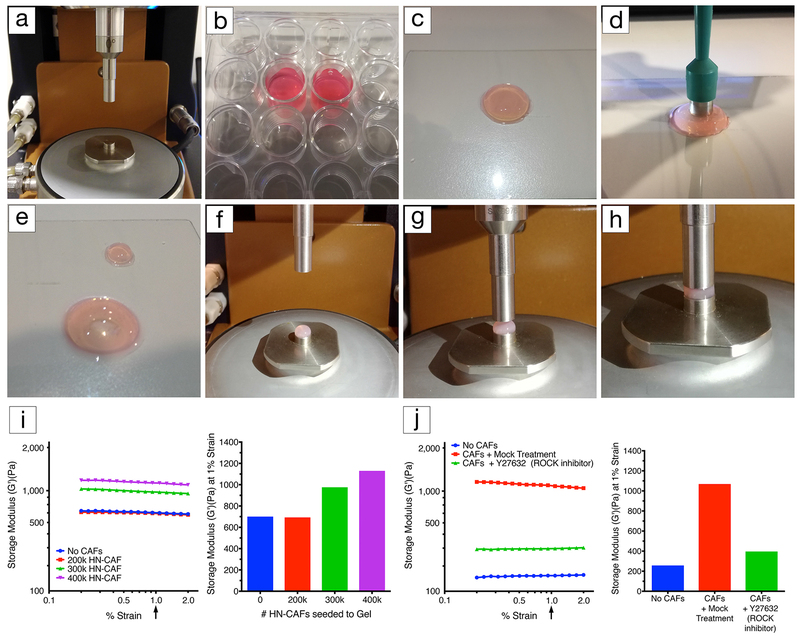 b. CAF-embedded hydrogels in a 24-well plate covered with growth medium. c. CAF-embedded hydrogel taken out of the 24-well plate using a spatula. d. Using an 8 mm disposable biopsy punch to excise an 8 mm diameter CAF-embedded hydrogel biopsy for profiling. e. Image illustrating the CAF-embedded hydrogel after excision. f. Excised hydrogel biopsy placed on the lower diameter geometry (8 mm in diameter). g. Lowering of the upper geometry (8 mm in diameter). h. Upper geometry in contact with the hydrogel. Applying axial force to the hydrogel until reaching a stable force of 0.03 N. i. Representative example of CAF-induced remodelling of collagen type I/Matrigel hydrogels. The storage modulus (G’) of collagen type I/Matrigel hydrogels is measured after 72 h of CAF remodelling. CAFs are still alive within the hydrogels upon measurement (see Notes). The storage modulus is measured over a decade of oscillation strain from 0.2% to 2%. The bar chart represents the storage modulus at 1% strain, and illustrates that increasing the number of CAFs induces stiffening of the hydrogel. j. Representative example of how CAF-induced remodelling of collagen type I/Matrigel hydrogels, and in turn stiffening can be blocked by perturbing the ROCK1/2 kinases (Rho-associated kinases1 and 2). The storage modulus (G’) of collagen type I/Matrigel hydrogels is measured after 72 h of CAF remodelling has taken place under the inhibition of ROCK1/2 kinases using 10 µM Y-27632. CAFs are still alive within the hydrogels upon measurement. The graph represents the storage modulus at 1% strain, and illustrates that ROCK1/2-inhibition prevents CAFs from remodelling and stiffening their environment. To ensure reliable data make sure to perform three technical repeats in each experiment. Extract the storage modulus (G’) at 1% strain for each technical repeat when comparing multiple gel measurements (Figures 1i and 1j). Make sure to conduct the experiment three biological times using the appropriate controls. Ensure a linear viscoelastic (storage modulus [G’]) response within the strain range evaluated (Figures 1i and 1j). If this is not the case disregard the measurement. If this is a recurrent issue, one should lower the strain range (to less than 1%) and extract the storage modulus (G’) at i.e., 0.1-0.5% strain. It is very important to ensure the collagen type I and Matrigel solutions remain ice-cold. Thaw aliquots of Matrigel on ice (or at 4 °C overnight). Always vortex the 5x collagen buffer solution just before use. This ensures good resuspension of precipitated NaHCO3. Optimization of cell numbers depends on the set-up of the experiment. One has to decide how quick the remodelling will take. The more cells that are incorporated into the gels, the quicker the remodelling will occur. We normally suggest 48-72 h of remodelling for highly active cells such as CAFs (Madsen et al., 2015). The use of different concentrations of collagen type I and Matrigel will affect the initial properties of the hydrogel. The higher the concentration, the higher the stiffness of the gels. As a consequence, a greater number of cells, or a longer period of remodelling may be needed to effectively detect small changes in the biomechanical properties of the hydrogel during the experimental time frame. When using different volumes of collagen type I and Matrigel, the final volume is adjusted with growth medium. The viability of hydrogels embedded CAFs can be determined in various ways (Ruedinger et al., 2015): 1) Cells can be dissociated from the hydrogels using i.e., collagenase/dispase treatment for 1 h at 37 °C, followed by cell counting using either hemocytometer, automated cell counters or flow cytometry. 2) Total DNA/RNA levels can be determined upon extraction. 3) Various metabolic assays e.g., MTT, CellTiter-Blue and ATP assays (Ruedinger et al., 2015). The gels were only minimally frequency dependent within the range of testing and showed a linear viscoelastic response within the strain range evaluated (see Figure 1). When applying an axial force to the gels prior to starting the measurements, ensure this is consistent across measurements. A value of 0.03 N for gels described above is sufficient. Always make sure to compare measurements from paired experiments of gels made at the same time. Note: Store master stocks at -20 °C. Store smaller working solutions at 4 °C. This protocol was adapted from previous published papers (Madsen et al., 2015; Cox et al., 2013; Baker et al., 2013). TRC is supported by an NHMRC New Investigator grant, Australia. CDM is supported by the Ragnar Söderberg Foundation, BioCARE, Cancerfonden, and Åke Wiberg foundation, all Sweden. We also thank Professor Janine Erler at the Biotech Research & Innovation Centre, University of Copenhagen for providing access to the rheometer. Baker, A. M., Bird, D., Lang, G., Cox, T. R. and Erler, J. T. (2013). Lysyl oxidase enzymatic function increases stiffness to drive colorectal cancer progression through FAK. Oncogene 32(14): 1863-1868. Bonnans, C., Chou, J. and Werb, Z. (2014). 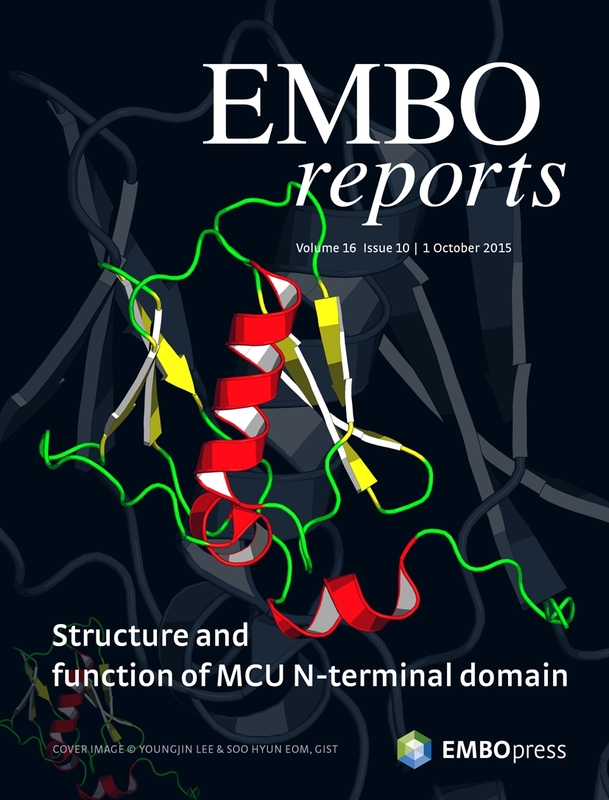 Remodelling the extracellular matrix in development and disease. Nat Rev Mol Cell Biol 15(12): 786-801. Cox, T. R. and Erler, J. T. (2011). Remodeling and homeostasis of the extracellular matrix: implications for fibrotic diseases and cancer. Dis Model Mech 4(2): 165-178. Cox, T. R., Bird, D., Baker, A. M., Barker, H. E., Ho, M. W., Lang, G. and Erler, J. T. (2013). LOX-mediated collagen crosslinking is responsible for fibrosis-enhanced metastasis. Cancer Res 73(6): 1721-1732. Gaggioli, C., Hooper, S., Hidalgo-Carcedo, C., Grosse, R., Marshall, J. F., Harrington, K. and Sahai, E. (2007). Fibroblast-led collective invasion of carcinoma cells with differing roles for RhoGTPases in leading and following cells. Nat Cell Biol 9(12): 1392-1400. Humphrey, J. D., Dufresne, E. R. and Schwartz, M. A. (2014). Mechanotransduction and extracellular matrix homeostasis. Nat Rev Mol Cell Biol 15(12): 802-812. Kai, F., Laklai, H. and Weaver, V. M. (2016). Force matters: Biomechanical regulation of cell invasion and migration in disease. Trends Cell Biol 26(7): 486-497. Kasas, S. and Dietler, G. (2008). Probing nanomechanical properties from biomolecules to living cells. Pflugers Arch 456(1): 13-27. Madsen, C. D., Pedersen, J. T., Venning, F. A., Singh, L. B., Moeendarbary, E., Charras, G., Cox, T. R., Sahai, E. and Erler, J. T. (2015). Hypoxia and loss of PHD2 inactivate stromal fibroblasts to decrease tumour stiffness and metastasis. EMBO Rep 16(10): 1394-1408. Picout, D. R. and Ross-Murphy, S. B. (2003). Rheology of biopolymer solutions and gels. ScientificWorldJournal 3: 105-121. Ruedinger, F., Lavrentieva, A., Blume, C., Pepelanova, I. and Scheper, T. (2015). Hydrogels for 3D mammalian cell culture: a starting guide for laboratory practice. Appl Microbiol Biotechnol 99(2): 623-636. How to cite: Cox, T. R. and Madsen, C. D. (2017). Relative Stiffness Measurements of Cell-embedded Hydrogels by Shear Rheology in vitro. Bio-protocol 7(1): e2101. DOI: 10.21769/BioProtoc.2101.